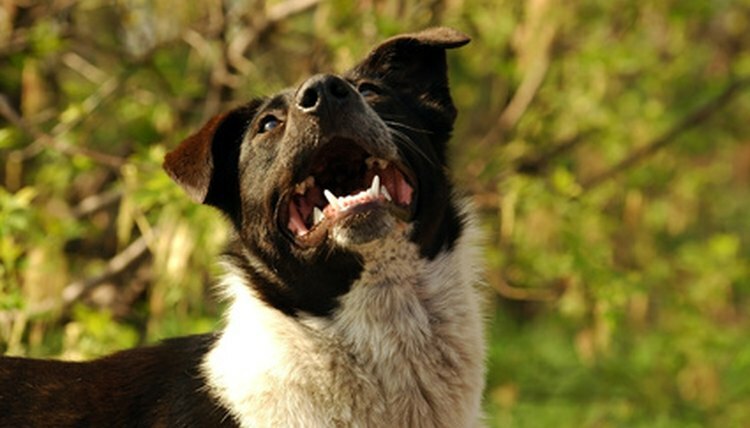 The risks of poor canine dental health go beyond stinky breath. According to the American Veterinary Medical Association, approximately 80 percent of dogs display signs of dental disease by age 3. Severe canine oral disease can lead to kidney, heart or liver disease as bacterial infections spread. Brushing your dog's teeth on a regular basis is one way to combat discomfort, tartar buildup, and expensive tooth cleaning and removal. For routine teeth brushing, baking soda and water will help keep your dog's pearly whites tartar-free and smelling fresh. Place 1 tbsp. baking soda into a small cup and add 1 tsp. water. Use a shallow cup that will allow you to easily mix and collect the toothpaste on your dog's toothbrush. Mix the ingredients using a fork. Use brisk, circular motions and scale the sides of the cup to minimize any extraneous lumps of baking soda. Stir until the baking soda and water form a pasty, white substance. Scoop the pasty, white substance onto the toothbrush. Have your dog secured close by to avoid running through the house with a dripping, pasty toothbrush. Stand on the side of your dog and gently lift his lips. Brush his teeth with the baking soda paste for 30 seconds using massaging, circular motions. Reward him with a treat when you're done so that he associates the experience with something enjoyable. If your dog is older or has significant tartar buildup, speak with your vet about appropriate treatments. Brushing a dog's teeth is an excellent preventive measure, but can be painful and ineffective after periodontal disease develops. Avoid using human toothpaste to brush your 'teeth. The fluoride can damage your dog's stomach and the foaming sensation is unpleasant.